Decorative Arts – The Monroe guest house showcases a rich collection of objects original to James and Elizabeth Monroe, as well as period pieces similar to those owned by the Monroes, and some modern reproductions. At James Monroe’s Highland you’ll discover classically inspired French furnishings imported from Europe during the reign of Napoleon, as well as finely crafted American furniture. The Monroes’ mahogany bed and bedchamber furniture, for example, are based on the designs of Duncan Phyfe. Earlier American designs such as a Windsor rocker and mid-eighteenth-century table are also on display. The imported English styles you’ll see include a bow-front china cabinet and a set of eagle-back chairs dating to the time of George III (1738-1820). Study – James Monroe’s study holds many reminders of the fifth president’s momentous political career. Featured are a Louis XVI desk almost identical to the “Monroe Doctrine Desk” (which now resides in the James Monroe Museum in Fredericksburg), and reproduction portraits of numerous early nineteenth century political leaders. Children’s Room – The beautifully furnished children’s room contains a king’s crown canopy bed and bedsteps like those used by Maria Hester, the Monroes’ younger daughter. Visible in the room is a sampler stitched by Maria Hester, when she was eleven years old. The Aubusson carpet in tapestry weave was popular in France in the 1700s. Bedroom – The Monroes’ high-post bed—with its magnificently carved feather-and-palm motifs—conceals a trundle, which provided an additional sleeping space. One of the most significant surviving Monroe pieces is on display in this room: the bureau with its green marble top made for James Monroe during his first term as president by Washington, DC-area cabinetmaker Robert Davies. Dining Room – This room’s centerpiece is a Hepplewhite dining table purchased shortly after the Monroes’ marriage in 1786. The addition of semicircular banquet ends allows this table to be expanded for guests. The dining room combines American furniture and European style tablewares, illustrating the Monroes’ time spent Europe, and James Monroe’s contributions in building relationships between the young U.S. and mature European nations. Drawing Room – The Monroes, thanks to their time abroad, imported many items from Napoleonic France. The French mantel clock and the drawing-room chairs (made in Paris, ca. 1800), are fine examples of Neoclassical influence during the French Empire. The reproduction carpet, too, features French Empire decorative details. The antique nineteenth-century wallpaper—“Paysage a Chasse” by Jean Zuber—beautifully re-creates the feeling of French tapestries owned by the Monroes. The three large portraits, on loan from a private collection, were given to the Monroes by Queen Hortense of Holland upon the christening of Hortensia Monroe Hay, Eliza’s daughter and the first Monroe grandchild. (They portray Queen Hortense, her brother Eugène, and Madame Campan, headmistress of the school attended by Hortense and Eliza Monroe.) Perhaps fittingly, the room is dominated by Napoleon Bonaparte. The larger-than-life bust by Chaudet was presented to Monroe by the Emperor himself. Kitchen – In Monroe’s day, the kitchen and service yard to the south of the main house were a blur of activity. Cooks busily prepared meals in “the stone kitchen cellar” (as Monroe described the basement in his 1809 insurance policy), while other activity occurred in and around the plantation’s numerous outbuildings. From the kitchen and its adjoining wine cellar, stairs offered easy access to the home’s upper gallery, or porch. Just a few steps away, water was drawn from Monroe’s well. The neatly arranged kitchen yard still contains the original Smokehouse (for curing meats and fish), and the Overseer’s House. Between those two structures stands a reconstructed three-room dwelling. This building was reconstructed in the 1980s based on photographic evidence of a structure that survived into the early 20th century. 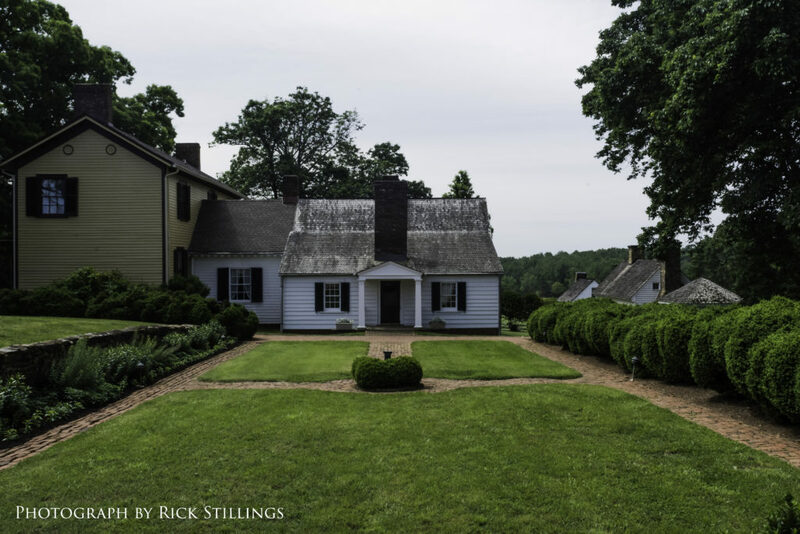 It is understood from an 1818 letter from James Monroe to his son-in-law that the three rooms originally housed enslaved workers, and were later converted to accommodations for guests. Victorian-Style Wing – These two rooms, part of the wing added circa 1870, contain permanent and rotating exhibitions. Currently featured in this space is an exhibit dedicated to foreign affairs. Among the objects permanently on display is a dropleaf table—made from Honduran mahogany circa 1825—that was sent to Monroe on behalf of the people of Santo Domingo, now the Dominican Republic, in gratitude for Monroe’s famous statement of foreign policy. Known as “the Monroe Doctrine,” this policy protected the Western Hemisphere from European political and military intervention. There is also a bust of Monroe sculpted by Attilio Piccirilli. The exhibit space contains reproductions of two dresses worn by Elizabeth Kortright Monroe, and a copy of Emanuel Leutze’s iconic oil painting “Washington Crossing the Delaware.” Powerfully executed in 1851, it depicts Gen. George Washington’s surprise crossing of the ice-clogged Delaware River on the night of December 25–26, 1776. Standing directly behind Washington, gripping the American flag, is 18-year-old Lieut. James Monroe, future president of the United States. Plantations – Plantations were large money-making enterprises, and ideally produced most goods that were needed on site as well as a surplus of crops and other products for sale. Initially, Monroe found that only a small portion of Highland was cultivated. In 1798, however, he estimated that the plantation could produce 20,000 pounds of tobacco. To increase production, he –like his friend and neighbor Thomas Jefferson—experimented with a variety of agricultural techniques. Monroe successfully planted cover crops, and plowed plaster of paris, or gypsum, into the soil, techniques of boosting soil productivity. Eventually Monroe replaced tobacco with grain crops, which were less draining on the soil. The plantation had both a gristmill and a sawmill, so had the capacity to grind the plantation’s corn and wheat, and process timber from Highland’s 2,000 wooded acres. The blacksmith who shod horses and hammered ironware was likely an enslaved man who lived on the plantation. Other enslaved workers were kept busy spinning and weaving wool and flax, one of the service yard’s most important activities. Since foreign cloth was extremely costly, Monroe imported Spanish Merino sheep to Highland, where he cross-bred them with his domestic animals. Gardens – Today Highland has ornamental and utilitarian gardens, as did Monroe’s property in the early 1800s. As a cultured lady, Elizabeth Monroe required fresh and dried flowers for her bouquets. Her household also required numerous herbs—herbs for cooking, herbs for scenting the linens and repelling moths, and herbs for their medicinal properties, and still other plants for dyeing fabrics. She must have found, as Highland gardeners find today, that some plants thrive in the rich red Virginia earth, while others struggle and eventually die. Today’s vegetable garden, just outside the kitchen yard, yields cabbage, beans, corn, squash, tomatoes, and numerous kinds of greens. Many of these were also grown on plantations in the Virginia Piedmont. On the Grounds – The estate’s mature Boxwood Gardens, planted over a century ago, are graced by a magnificent white oak. Still standing from Monroe’s day, this majestic “witness tree” is twenty feet in circumference. The formal landscape provides a number of peaceful garden settings for museum and private social events. Many of the deciduous trees around the house and formal gardens are white ash trees. 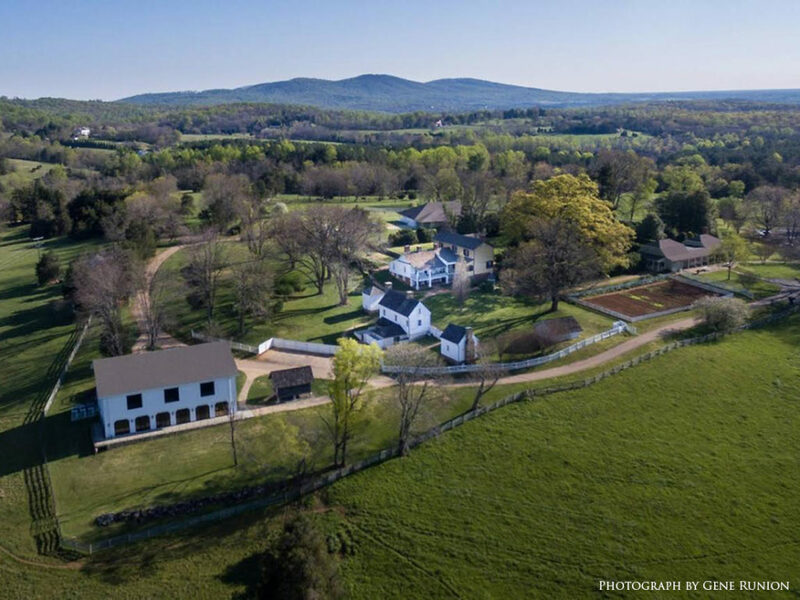 These regal residents line the estate’s scenic entranceway, and stretch across the northwest lawn toward a ridge along Carter’s Mountain and Highland’s boundary.